The commercial success of the Byrds' cover version of Dylan's "Mr. Tambourine Man" and their debut album of the same name, along with Dylan's own recordings with rock instrumentation—on the albums Bringing It All Back Home (1965), Highway 61 Revisited (1965), and Blonde on Blonde (1966)—encouraged other folk acts, such as Simon & Garfunkel, to use electric backing on their records and new groups, such as Buffalo Springfield, to form. Dylan's controversial appearance at the Newport Folk Festival on 25 July 1965, where he was backed by an electric band, was also a pivotal moment in the development of the genre. In its earliest and narrowest sense, the term "folk rock" refers to the blending of elements of folk music and rock music, which arose in the U.S. and UK in the mid-1960s. The genre was pioneered by the Byrds, who began playing traditional folk music and songs by Bob Dylan with rock instrumentation, in a style heavily influenced by the Beatles and other British Invasion bands. The term "folk rock" was initially coined by the U.S. music press to describe the Byrds' music in June 1965, the month in which the band's debut album was issued. Dylan also contributed to the creation of the genre, with his recordings utilizing rock instrumentation on the albums Bringing It All Back Home, Highway 61 Revisited, and Blonde on Blonde. In a broader sense, folk rock encompasses similarly inspired musical genres and movements in different regions of the world. Folk rock may lean more towards either folk or rock in instrumentation, playing and vocal style, and choice of material. While the original genre draws on music of Europe and North America, there is no clear delineation of which other culture's music might be included as influences. The term is not typically associated with blues-based rock music, African American music, Cajun-based rock music, nor music with non-European folk roots. There are some exceptions which are mediated through folk revivalists. The American folk-music revival began during the 1940s; building on the interest in protest folk singers such as Woody Guthrie and Pete Seeger, it reached a peak in popularity in the mid-1960s with artists such as Bob Dylan and Joan Baez. In 1948, Seeger formed the Weavers, whose mainstream popularity set the stage for the folk revival of the 1950s and early 1960s and also served to bridge the gap between folk, popular music, and topical song. The Weavers' sound and repertoire of traditional folk material and topical songs directly inspired the Kingston Trio, a three-piece folk group who came to prominence in 1958 with their hit recording of "Tom Dooley". The Kingston Trio provided the template for a flood of "collegiate folk" groups between 1958 and 1962. An excerpt from the Kingston Trio's hit recording of the traditional folk song "Tom Dooley". The song reached #1 on the Billboard Hot 100 chart in 1958 and provided a template for the nascent "collegiate folk" movement, which itself was one of the foundation stones of the mid-1960s folk rock boom. At roughly the same time as these "collegiate folk" vocal groups came to national prominence, a second group of urban folk revivalists, influenced by the music and guitar picking styles of folk and blues artist such as Woody Guthrie, Lead Belly, Brownie McGhee, and Josh White, also came to the fore. Many of these urban revivalists were influenced by recordings of traditional American music from the 1920s and 1930s, which had been reissued by Folkways Records; Harry Smith's Anthology of American Folk Music was particularly influential. While this urban folk revival flourished in many cities, New York City, with its burgeoning Greenwich Village coffeehouse scene and population of topical folk singers, was widely regarded as the centre of the movement. Out of this fertile environment came such folk-protest luminaries as Bob Dylan, Tom Paxton, Phil Ochs, and Peter, Paul and Mary, many of whom would transition into folk rock performers as the 1960s progressed. The vast majority of the urban folk revivalists shared a disdain for the values of mainstream American mass culture and led many folk singers to begin composing their own "protest" material. The influence of this folk-protest movement would later manifest itself in the sociopolitical lyrics and mildly anti-establishment sentiments of many folk rock songs, including hit singles such as "Eve of Destruction", "Like a Rolling Stone", "For What It's Worth", and "Let's Live for Today". During the 1950s and early 1960s in the UK, a parallel folk revival referred to as the second British folk revival, was led by folk singers Ewan MacColl and Bert Lloyd. Both viewed British folk music as a vehicle for leftist political concepts and an antidote to the American-dominated popular music of the time. However, it wasn't until 1956 and the advent of the skiffle craze that the British folk revival crossed over into the mainstream and connected with British youth culture. 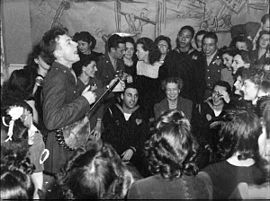 Skiffle renewed popularity of folk music forms in Britain and led directly to the progressive folk movement and the attendant British folk club scene. Among the leading lights of the progressive folk movement were Bert Jansch and John Renbourn, who would later form the folk rock band Pentangle in the late 1960s. Other notable folk rock artists with roots in the progressive folk scene were Donovan, Al Stewart, John Martyn and Paul Simon. Beginning in 1964 and lasting until roughly 1966, a wave of British beat groups, including the Beatles, the Rolling Stones, the Dave Clark Five, Gerry & the Pacemakers, the Kinks, and Herman's Hermits amongst others, dominated the U.S. music charts. These groups were all heavily influenced by American rock 'n' roll, blues, and R&B—musical genres they had been introduced to via homegrown British rock 'n' roll singers, imported American records, and the music of the skiffle craze. These UK groups, known collectively as the British Invasion, reintroduced American youth culture to the broad potential of rock and pop music as a creative medium and to the wealth of musical culture to be found within the United States. The subtle folk influences evident in such Beatles' songs as "I'm a Loser" were important in demonstrating how folk-based chord progressions and melodies could be to assimilated into pop music. The use of folk influences in the Beatles' music became even more explicit during 1965, with the release of "You've Got to Hide Your Love Away". Of particular importance to the development of folk rock by the British Invasion were the subtle folk influences evident in such Beatles' compositions as "I'll Be Back", "Things We Said Today", and "I'm a Loser", with the latter song being directly inspired by folk singer-songwriter Bob Dylan. In the opinion of Roger McGuinn of the Byrds, writers who attempt to define the origins of folk rock "don't realise that the Beatles were responsible as far back as 1963". He cites "She Loves You" as one of the first examples where the Beatles introduced folk chord changes into rock music and so initiated the new genre. These songs were all influential in providing a template for successfully assimilating folk-based chord progressions and melodies into pop music. This melding of folk and rock 'n' roll in the Beatles' music became even more explicit during 1965, with the release of "You've Got to Hide Your Love Away", a folk-derived song with introspective lyrics, again influenced by Dylan. Although the Beatles themselves utilized folk as just one of many styles evident in their music, the underlying folk influences in a number of their songs would prove to be important to folk rock musicians attempting to blend their own folk influences with beat music. The effect that the music of these British bands, and the Beatles in particular, had on young Americans was immediate; almost overnight, folk—along with many other forms of homegrown music—became passé for a large proportion of America's youth, who instead turned their attention to the influx of British acts. The influence of these acts also impacted on the collegiate folk and urban folk communities, with many young musicians quickly losing interest in folk music and instead embracing the rock 'n' roll derived repertoire of the British Invasion. Future members of many folk rock acts, including the Byrds, Jefferson Airplane, the Lovin' Spoonful, the Mamas & the Papas, and Buffalo Springfield, all turned their backs on traditional folk music during 1964 and 1965 as a direct result of the influence of the Beatles and the other British Invasion bands. Author and music historian Richie Unterberger has noted that the Beatles' impact on American popular culture effectively sounded the death knell for the American folk music revival. In addition to The Beatles, the two British groups that were arguably the most influential on the development of folk rock were the Animals and the Searchers. The Animals released a rock interpretation of the traditional folk song "The House of the Rising Sun" in the U.S. in August 1964. The song reached number 1 on the Billboard Hot 100 singles chart and stayed there for three weeks, selling over a million copies in just five weeks in the U.S. The band's arrangement of "The House of the Rising Sun", which transmuted the song from an acoustic folk lament to a full-bore electric rock song, would go on to influence many folk rock acts but none more so than Dylan himself, who cited it as a key factor in his decision to record and perform with an electric rock band in 1965. The Searchers were influential in popularizing the jangly sound of the electric twelve-string guitar. Many musicians in the collegiate and urban folk movements were already familiar with acoustic twelve-string guitars via the music of folk and blues singer Lead Belly. However, the Searchers' use of amplified twelve-strings provided another example of how conventional folk elements could be incorporated into rock music to produce new and exciting sounds. The Beatles' lead guitarist, George Harrison, also influenced this trend towards jangly guitars in folk rock with his use of a Rickenbacker twelve-string guitar on the Beatles' mid-1960s recordings. This relatively clean, jangly sound—without distortion or other guitar effects—became a cornerstone of folk rock instrumentation and was used in many American folk rock records made during 1965 and 1966. Although folk rock mainly grew out of a mix of American folk revival and British Invasion influences, there were also a few examples of proto-folk rock that were important in the development of the genre. Of these secondary influences, Unterberger has cited the self-penned, folk-influenced material of San Francisco's the Beau Brummels as arguably the most important. Despite their Beatlesque image, the band's use of minor chords, haunting harmonies, and folky acoustic guitar playing—as heard on their debut single "Laugh, Laugh"—was stylistically very similar to the later folk rock of the Byrds. [nb 1] Released in December 1964, "Laugh, Laugh" peaked at number 15 on the Billboard Hot 100 in early 1965, while its similarly folk-flavored follow-up, "Just a Little", did even better, reaching number 8 on the U.S. singles chart. The high-profile success of the Beau Brummels' music was important in demonstrating that a hybrid of folk and rock could potentially be translated into mainstream commercial success. Pre-dating the Beau Brummels' commercial breakthrough by almost two years, singer-songwriter Jackie DeShannon's April 1963 single "Needles and Pins" marked, according to Unterberger, the earliest appearance of the ringing guitar sound that would become a mainstay of early folk rock. This use of cyclical, chiming guitar riffs was repeated on DeShannon's late 1963 recording of her own composition "When You Walk in the Room". The following year, both songs would become hits for the Liverpudlian band the Searchers, who chose to place even greater emphasis on the jangly guitar playing in the songs. In addition, a number of DeShannon's songs from the period, including "When You Walk in the Room", displayed a greater degree of lyrical maturity and sensuality than was usual for pop songs of the time. This heightened degree of emotional introspection was inspired by her love of Bob Dylan's folk songwriting and represents one of the first attempts by an American artist to absorb folk sensibilities into rock music. In the UK, the folk group the Springfields (featuring Dusty Springfield) had been releasing folk-oriented material featuring full band arrangements since the early 1960s, including renditions of "Lonesome Traveler", "Allentown Jail", and "Silver Threads and Golden Needles". Although these records owed more to orchestral pop than rock, they were nonetheless influential on up-and-coming folk rock musicians on both sides of the Atlantic. In mid-1965, folk singer-songwriter Donovan was also experimenting with adding electrified instrumentation to some of his folk and blues-styled material, as evidenced by songs such as "You're Gonna Need Somebody on Your Bond" and "Sunny Goodge Street". In spite of his folky persona and repertoire, Donovan himself had always considered himself a pop star, rather than a folk singer. As a result, he had been thinking of a way in which to introduce folk styled acoustic guitars and socially conscious lyrics into pop music for several years prior to his 1965 breakthrough as a recording artist. By January 1966, he had recorded the self-penned hit "Sunshine Superman" with a full electric backing band. Other bands and solo artists who were blurring the boundaries between folk and rock in the early 1960s include Judy Henske, Richard and Mimi Fariña, and the Mugwumps, the latter of which were a New York band featuring future members of the Lovin' Spoonful and the Mamas & the Papas. Also of note are the Australian band the Seekers, who had relocated to England in 1964 and reached number 1 on the UK Singles Chart with "I'll Never Find Another You" in February 1965. Unterberger has noted that, although it was not strictly a folk song, "I'll Never Find Another You" was heavily influenced by Peter, Paul and Mary and featured a cyclical, twelve-string guitar part that sounded similar to the guitar style that Jim McGuinn of the Byrds would popularize later that same year. There are also a few antecedents to folk rock present in pre-British Invasion American rock 'n' roll, including Elvis Presley's 1954 cover of the Bill Monroe bluegrass standard "Blue Moon of Kentucky"; Buddy Holly's self-penned material, which strongly influenced both Dylan and the Byrds; Ritchie Valens' recording of the Mexican folk song "La Bamba"; Lloyd Price's rock 'n' roll adaptation of the African-American folk song "Stagger Lee" (originally recorded by Mississippi John Hurt in 1928); Jimmie Rodgers' rock 'n' roll flavored renditions of traditional folk songs; and the folk and country-influenced recordings featured on the Everly Brothers' 1959 album Songs Our Daddy Taught Us. It was during the rehearsals at World Pacific that the band began to develop the blend of folk music and Beatles-style pop that would characterize their sound. However, this hybrid was not deliberately created; it evolved organically out of some of the band members' own folk music roots and their desire to emulate the Beatles. The band's folk influences, lack of experience with rock music forms, and Beatleseque instrumentation all combined to color both their self-penned material and their folk derived repertoire. The band themselves soon realized that there was something unique about their music and, with Dickson's encouragement, they began to actively attempt to bridge the gap between folk and rock. An excerpt from the Byrds' version of "Mr. Tambourine Man", highlighting the song's blend of abstract lyrics, folky melody, jangly 12-string Rickenbacker guitar, clear vocal harmonies, and Beatlesque beat. Dylan's material would provide much of the original grist for the folk rock mill, not only in the U.S. but in the UK as well, with many pop and rock acts covering his material in a style reminiscent of the Byrds. Their reworking of "Mr. Tambourine Man", along with the Animals' rock interpretation of "The House of the Rising Sun" (itself based on Dylan's earlier cover), helped to give Dylan the impetus to start recording with an electric backing band. As the 1970s dawned, folk rock evolved away from the jangly template pioneered by the Byrds, but their influence could still be heard in the music of bands like Fairport Convention and Pentangle. The Byrds themselves continued to enjoy commercial success with their brand of folk rock throughout 1965, most notably with their number 1 single "Turn! Turn! Turn!". By the start of 1966, however, the group had begun to move away from folk rock and into the new musical frontier of psychedelic rock. The folk rock sound of the Byrds has continued to influence many bands over the years, including Big Star, Tom Petty and the Heartbreakers, R.E.M., the Long Ryders, the Smiths, the Bangles, the Stone Roses, and Teenage Fanclub, among others. Five days before the Byrds entered Columbia Studios in Hollywood to record his song "Mr. Tambourine Man", Bob Dylan completed the recording sessions for his fifth album, Bringing It All Back Home. Of the eleven tracks on the album, seven featured Dylan backed by a full electric rock band, in stark contrast to his earlier acoustic folk albums. Dylan's decision to record with an electric backing band had been influenced by a number of factors, including the Beatles' coupling of folk derived chord progressions and beat music, the Byrds' rock adaptation of "Mr. Tambourine Man", and the Animals hit cover of "The House of the Rising Sun". Bringing It All Back Home was released on 22 March 1965, peaking at number 6 on the Billboard Top LPs chart and #1 on the UK Album Chart. The album's blend of rhythm and blues-derived rock and abstract, poetic lyrics was immediately influential in demonstrating that intelligent lyrical content could be wedded with rock 'n' roll. The songs on the album saw Dylan leaving folk music far behind. Even with this folkier, acoustic material, Dylan's biting, apocalyptical, and often humorous lyrics went far beyond those of contemporary folk music, particularly the folk-protest music with which he had been previously associated. On 20 July 1965, Dylan released the groundbreaking "Like a Rolling Stone", a six-minute-long scathing put-down, directed at a down-and-out society girl, which again featured Dylan backed by an electric rock band. Released just as the Byrds' cover of "Mr. Tambourine Man" topped the charts in the United States, the song was instrumental in defining the burgeoning folk rock scene and in establishing Dylan as a bona fide rock star, rather than a folksinger. "Like a Rolling Stone" managed to reach the Top 5 on both sides of the Atlantic. Five days after the release of "Like a Rolling Stone", on 25 July 1965, Dylan made a controversial appearance at the Newport Folk Festival, performing three songs with a full band. He was met with derisive booing and jeering from the festival's purist folk music crowd, but in the years since the incident, Dylan's 1965 Newport Folk Festival appearance has become widely regarded as a pivotal moment in the synthesis of folk and rock. 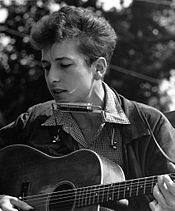 Dylan followed "Like a Rolling Stone" with the wholly electric album Highway 61 Revisited and the non-album single "Positively 4th Street", which itself has been widely interpreted as a rebuke to the folk purists who had rejected his new electric music. Throughout 1965 and 1966, hit singles like "Subterranean Homesick Blues", "Like a Rolling Stone", "Positively 4th Street", and "I Want You" among others, along with the Bringing It All Back Home, Highway 61 Revisited and Blonde on Blonde albums, proved to be hugely influential on the development and popularity of folk rock. Although Dylan's move away from acoustic folk music served to outrage and alienate much of his original fanbase, his new folk rock sound gained him legions of new fans during the mid-1960s. The popularity and commercial success of the Byrds and Bob Dylan's blend of folk and rock music influenced a wave of imitators and emulators that retroactively became known as the folk rock boom. Music critic Richie Unterberger has noted that the commercial success of the Byrds' cover version of Dylan's "Mr. Tambourine Man", along with Dylan's own contributions to the genre on the albums Bringing It All Back Home, Highway 61 Revisited, and Blonde on Blonde, initiated an explosion of emulators and imitators. Their success led record producer Tom Wilson to add electric guitar, bass, and drums overdubs to "The Sounds of Silence", a song which had been recorded by the folk duo Simon & Garfunkel in 1964 and first released on their album Wednesday Morning, 3 A.M.. The reissued single rose to number 1 on the Billboard pop chart in late 1965, became a hit around the world, and set the duo on one of the most successful careers in pop and rock music. Simon and Garfunkel have been described as "folk-rock's greatest duo, and one whose fame and influence would persist well beyond folk-rock's heyday." One of the first bands to craft a distinctly American sound in response to the British Invasion was the Beach Boys; while not a folk rock band themselves, they directly influenced the genre and at the height of the folk rock boom in 1966 had a hit with a cover of the 1920s West Indian folk song "Sloop John B", which they had learned from the Kingston Trio, who had learned it from the Weavers. Much of the early folk-rock music emerged during a time of general global upheaval, the Vietnam War, and new concerns for the world by young people. In the United States, the heyday of folk rock was arguably between the mid-sixties and the mid-seventies, when it aligned itself with the hippie movement and became an important medium for expressing radical ideas. Cities such as San Francisco, Denver, New York City and Phoenix became centers for the folk rock culture, playing on their central locations among the original folk circuits. The "unplugged" and simplified sound of the music reflected the genre's connection to a critical view of a technological and consumerist society. Unlike pop music's escapist lyrics, arguably a fantasy distraction from the problems in life, folk artists attempted to communicate concerns for peace, global awareness, and other touchstones of the era. Bands whose music was significantly folk rock in sound during the mid-to-late 1960s included Donovan, the Lovin' Spoonful, the Mamas & the Papas, the Youngbloods, Love, and, in their early years, Jefferson Airplane. In the mid-1960s, singer-songwriter Gordon Lightfoot began moving his folk songs into a folk-rock direction with recordings such as the percussion-driven "Black Day In July" about the 1967 Detroit riot. He would rise to top the charts in the 1970s with a number of his folk-rock recordings such as "Sundown" and "Carefree Highway" and eventually become known as a folk-rock legend. Some artists who originally produced with a harder edged rock sound found the ability to communicate more easily and felt more genuine in this method of delivery. In this category was Cat Stevens, who began in London much like the Byrds did in the United States but toned down the sound more frequently with acoustic instruments. He performed songs that contained concern for the environment, war, and the future of the world in general. The Canadian singer-songwriter Joni Mitchell won many Grammy Awards with her folk rock/pop songs. A subgenre originally arising from the early 1960s folk and country-influenced music of singer-songwriter artists such as Bob Dylan and Bobby Bare, as well as from folk revivalist vocal groups like the Kingston Trio. During the late 1960s, many folk rock artists including Dylan, Ian and Sylvia, and the Byrds began to incorporate a strong country influence into their music, drawing heavily on Hank Williams, Merle Haggard, and Buck Owens amongst others, resulting in the concurrent offshoot of country rock. This successful blending of country, folk and rock styles led to pioneering country folk records by folk-influenced singer-songwriters such as John Denver and Neil Young during the 1970s. Country folk music usually displays a softer, more "laid-back" feel than the majority of country music and is often complemented by introspective lyrics, thus preserving its folk singer-songwriter roots. Since the 1970s, the country folk subgenre has been perpetuated by artists including John Prine, Nanci Griffith, Kathy Mattea, Mary Chapin Carpenter, and Iris DeMent. A subgenre of folk rock that combines traditional Celtic instrumentation with rock rhythms, often influenced by a wide varitety of pop and rock music styles. It emerged from the electric folk music of the late 1960s and was pioneered by bands such as Horslips, who blended Gaelic mythology, traditional Irish music and rock. The British singer-songwriter Donovan was also influential in developing Celtic rock during the late 1960s, with his albums The Hurdy Gurdy Man, Barabajagal, and Open Road, the latter of which actually featured a song entitled "Celtic Rock". The subgenre was further popularised in 1973 by Thin Lizzy, who had a hit with "Whiskey in the Jar", a traditional Irish song performed entirely in the rock idiom. Throughout the 1970s, Celtic rock held close to its folk roots, drawing heavily on traditional Celtic fiddle, pipe, and harp tunes, as well as traditional vocal styles, but making use of rock band levels of amplification and percussion. In the 1980s and beyond, Celtic rock was perpetuated by bands such as the Pogues, the Waterboys, Runrig, Black 47, and the Prodigals. A more recent folk rock band based in England is the BibleCode Sundays. Celtic rock is also popular in Spain where bands such as Celtas Cortos have had a large following since the early 1990s. Medieval folk rock developed as a subgenre of electric folk from about 1970 as performers, particularly in England, Germany and Brittany, adopted medieval and renaissance music as a basis for their music, in contrast to the early modern and nineteenth century ballads that dominated the output of Fairport Convention. This followed the trend explored by Steeleye Span, and exemplified by their 1972 album Below the Salt. Acts in this area included Gryphon, Gentle Giant and Third Ear Band. In Germany Ougenweide, originally formed in 1970 as an acoustic folk group, opted to draw exclusively on High German medieval music when they electrified, setting the agenda for future German electric folk. In Brittany, as part of the Celtic rock movement, medieval music was focused on by bands like Ripaille from 1977 and Saga de Ragnar Lodbrock from 1979. However, by the end of the 1970s almost all of these performers had either disbanded or moved, like Gentle Giant and Gryphon, into the developing area of progressive rock. In the 1990s, as part of the wider resurgence of folk music in general, new medieval folk rock acts began to appear, including the Ritchie Blackmore project Blackmore's Night, German bands such as In Extremo, Subway to Sally or Schandmaul and English bands like Circulus. In Britain the tendency to electrify brought several progressive folk acts into rock. This includes the acoustic duo Tyrannosaurus Rex, who became the electric combo T. Rex. 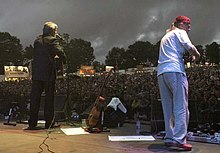 Others, probably influenced by the electric folk pioneered by Fairport Convention from 1969, moved towards more traditional material, a category including Dando Shaft, Amazing Blondel, and Jack the Lad, an offshoot of northern progressive folk group Lindisfarne, who were one of the most successful UK bands of the early 1970s. Examples of bands that remained firmly on the border between progressive folk and progressive rock were the short lived (but later reunited) Comus and, more successfully, Renaissance, who combined folk and rock with elements of classical music. British folk rock developed in Britain during the mid to late 1960s by the bands Fairport Convention, and Pentangle. It uses traditional British music and self-penned compositions in a traditional style, and is played on a combination of traditional and rock instruments. This incorporation of traditional British folk music influences gives British folk rock its distinctly British character and flavour. It evolved out of the psychedelia-influenced folk rock of British acts such as Donovan, the Incredible String Band, and Tyrannosaurus Rex, but was also heavily influenced by such American folk rock bands as the Byrds, Love, and Buffalo Springfield. British folk rock was at its most significant and popular during the late 1960s and 1970s, when, in addition to Fairport and Pentangle, it was also taken up by groups such as Steeleye Span and the Albion Band. Steeleye Span, founded by Fairport Convention bass player Ashley Hutchings, was made up of traditionalist folk musicians who wished to incorporate electrical amplification, and later overt rock elements, into their music. This, in turn, spawned the conspicuously English folk rock music of the Albion Band, a group that also included Hutchings. In Brittany folk rock was developed by Alan Stivell (who began to mix his Breton, Irish, and Scottish roots with rock music) and later by French bands like Malicorne. During this same period, folk rock was adopted and developed in the surrounding Celtic cultures of Ireland, Scotland, Wales, Brittany, and Cornwall, to produce Celtic rock and its derivatives. Folk rock also gave rise to the subgenre of Medieval folk rock and the fusion genres of folk punk and folk metal. By the 1980s the popularity of British folk rock was in steep decline but it has survived into the 21st century and has been revived as part of a more general folk resurgence since the 1990s. British folk music has also been influential in those parts of the world with close cultural connections to Britain, such as the U.S. and Canada. In Hungary the fusion of rock and folk music began in 1965, when the band Illés introduced Hungarian folk music elements into their beat-influenced music, winning everything which could be won in that time at festivals, TV contests, etc. Their rock-musical István, a király (Stephen I of Hungary), released in 1980 contains strong folk-influences and traditional folk songs as well. The film made based on the rock-opera was one of the biggest box-office hits in 1980. Later on bands like Barbaro, Gépfolklór, Kormorán and Drums have developed a distinctive sound using odd rhythms, progressive rock, Hungarian and Greek/Bulgarian/etc. folk traditions. Psychedelic Galloping Wonder Stag (2005-) continues Galloping Coroners' shaman punk with acoustic, folk-instrumented, extatic sound moving closer to original shamanic folk music. In Romania Transsylvania Phoenix (known in Romania simply as Phoenix), founded in 1962, introduced significant folk elements into their rock music around 1972 in an unsuccessful attempt to compromise with government repression of rock music. The attempt failed, and they ended up in exile during much of the Ceauşescu era, but much of their music still retains a folk rock sound. The present-day bands Spitalul de Urgenţă (Romanian) and Zdob şi Zdub (Moldova) also both merge folk and rock. Bijelo Dugme, which emerged in the mid-1970s, had huge success with their folk-influenced hard rock sound, becoming the most popular Yugoslav band, managing to sustain this status during the 1980s. However, at the beginning of the 1980s, Bijelo Dugme switched to new wave, and in the late 1980s to pop rock, but their last few releases also featured folk music elements. Late Bijelo Dugme albums influenced a number of pop rock/folk rock bands, mostly from Sarajevo: Crvena Jabuka, Plavi Orkestar, Merlin, Valentino, Hari Mata Hari, Jugosloveni. In the early 1990s, Serbian band Orthodox Celts emerged. They saw major success with their Irish folk/Celtic rock sound, influencing a number of younger bands, most notably Tir na n'Og and Irish Stew of Sindidun. Russian folk rock artists combine elements of Russian rock with celtic music, folk music of Northern countries as well as Russian folk music. Examples are the band Yat-Kha and Sak-Sok, who perform Tuvan and Tatar traditional music based on rock music. The first known fusions between rock music and folklore in Russia began with bands of the VIA generation till the end of the 1960s and the early 1970s, such as Pesniary and Ariel. The songs by the 1975 student ensemble "Ornament" are based on Anglo-American folk music. The group later renamed to Kukuruza and performed from 1986 on as a professional band. The band Kalinov Most was formed that year, releasing their debut album, Vyvoroten, in 1990, which contained "ethnical motiefs and shamanic motets". Numerous bands and musicians have cited this band as an influence, most notably Inna Zhelannaya and the band "Dvurechye". Less-known bands, such as "Ado", performed in the style of folk and country rock. The first half of the 1990s saw diverse groups such as "Sektor Gaza", "Ckazy Lesa" (formerly known as "Huligany"), "Rada i Ternovnik", "Ad Libitum" and "Bashnaya Rowan". Musicians of these groups incorporate, beside folk rock, several different genres, ranging from psychedelic music to Jazz and neo-folk. Sergey Kalugin's 1994 EP Nigredo became Russia's first dark folk album. The music realizes all kinds of mixtures between folk and rock. There are bands such as Die Streuner whose music is close to medieval music, but there are more bands whose music, though it is close to medieval music, use rock drums and rock-like rhythms and are more or less electrified (Vermaledyit, Feuerschwanz, Saltatio Mortis, Corvus Corax). Many bands plays even more rock-like folk-rock (Schandmaul, Faun, Ignis Fatuu) although Faun is hard to classify due to musice variation. Some bands play medieval metal (Tanzwut, In Extremo, Subway to Sally, Rabenschrei). In 1982 Lou Dalfin formed an Occitan group which performed traditional music with traditional instruments: ghironda, accordion and organetto, violin, flute, boha and bag pipe, with singing in the Occitan language. A new line-up of the band in 1990 played folk, jazz and rock using electric bass, drums, electric guitar, keyboard and saxophone. In 1988 Gigi Camedda, Gino Marielli and Andrea Parodi founded Tazenda, an Italian ethno-folk-rock group which uses a launeddas (the oldest reed instruments of the Mediterranean), the sampled "canti a tenore", the diatonic accordions are mixed with electric guitars and drums and harmonicas. In 1991 some performers from Emilia-Romagna founded Modena City Ramblers, which blends the Combat Rock musical style (The Clash) with folk, traditional Irish music, political songs (Contessa) and partisans' songs (Fischia il vento and Bella Ciao). Later M.C.R. used a world music sound and blended in rock, punk, tape loops and samples, creating a new genre called Celtic patchanka. Many groups were influenced by M.C.R. : Casa del Vento, Fiamma Fumana led by Alberto Cottica (electronic folk); Caravane de Ville of Giovanni Rubbiani; Ductia of Massimo Giuntini; Paulem and La strana famiglia led by Luciano Gaetani; and Cisco (former singer of M.C.R.) now a guitarist and drummer. Belgian-born South African Rock-singer Karen Zoid made headlines when her debut single ''Afrikaners is Plesierig'' (Afrikaans people are Fun) became a hit in 2001. The song is a slightly altered bilingual rock-version of the Afrikaans folk-song of the same name. It also inadvertently kick-started the Afrikaans Rock movement. ^ Neither the band nor their guitarist and chief songwriter Ron Elliott were overtly influenced by folk music. 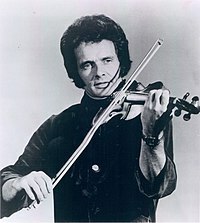 Elliot's own musical leanings were more towards country and western and musical theatre, with any folk influence in the band's music appearing to have been entirely unintentional. ^ The nucleus of the Byrds formed in early 1964, when Jim McGuinn, Gene Clark, and David Crosby—united by a shared love of the Beatles' music—came together under the moniker of the Jet Set at The Troubadour folk club in Los Angeles. The trio all had a background in folk music, with each member having worked as a folk singer on the acoustic coffeehouse circuit during the early 1960s. In addition, they had also spent time, independently of each other, in various folk groups, including the New Christy Minstrels, the Limeliters, the Chad Mitchell Trio, and Les Baxter's Balladeers. Soon after forming the Jet Set, Crosby introduced McGuinn and Clark to his associate Jim Dickson, who became the group's manager. Dickson had access to World Pacific Studios in Los Angeles, which he began to utilize as a rehearsal space for the band. During the course of 1964, the trio expanded their ranks to include drummer Michael Clarke and bassist Chris Hillman, with the band eventually changing their name to the Byrds in November. ^ Graeme Smith (January 1997). "'Wasn't That a Time!' Firsthand Accounts of the Folk Music Revival. Edited by Ronald D. Cohen. Metuchen, N.J. and London: The Scarecrow Press, 1995. 232 pp.Ethnomimesis. Folklife and the Representation of Culture. By Robert Cantwell. Chapel Hill and London: The University of North Carolina Press, 1993. 323 pp.Thirty Years of the Cambridge Folk Festival. Compiled and Edited by Dave Laing and Richard Newman. Ely: Music Maker Books, 1994. 162 pp". Popular Music. Cambridge University Press. 16 (1): 127. doi:10.1017/s0261143000000787.